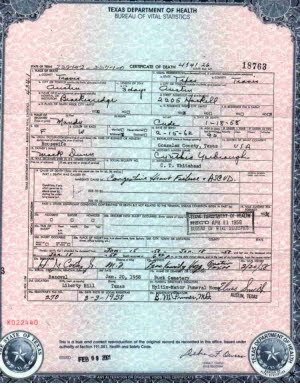 • You should order a Texas Birth Certificate online for births that occurred in Texas from 1903 to the present years. • You will receive a state certified copy of the Texas Birth Certificate if it was filed with Texas Vital Statistics. Birth Certificates with a date of birth within the last 75 years are considered to be protected records. Ordering a copy of your birth record through Online is restricted for security reasons. • Texas residents can order their own record or the records of immediate family members. • Customers in other states can order their own record or the record of their child if they are listed as a parent on the record. • Customers unable to order online can use other methods described on the Texas Vital Statistics website. Sample of state of Texas vital statistics "birth certificate"